Funnily enough, G is for Greek! It’s National Vegetarian Week and tonight i cooked a recipe that I’ve been wanting to try for ages! I’m afraid i can’t take the credit for this one, it’s a Good Food website special and it looks fab! In a saucepan, wilt the spinach (I added some rocket and watercress as i had it lying around in the fridge) drain in a sieve and leave to cool. Then squeeze out all the water from the greens. 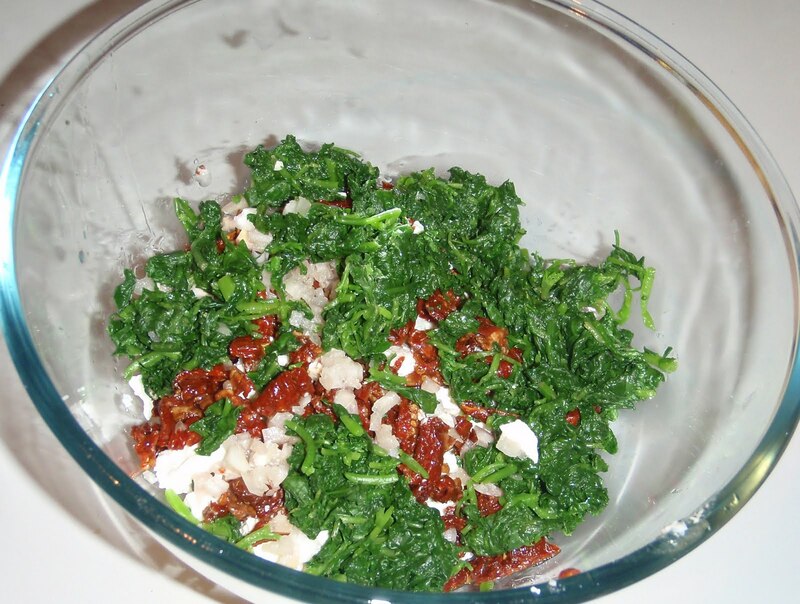 Chop up the feta, the sun-dried tomatoes, shallot and green bits and put the lot into a bowl. Add the two eggs and mix the lot together. Put the lot to one side. 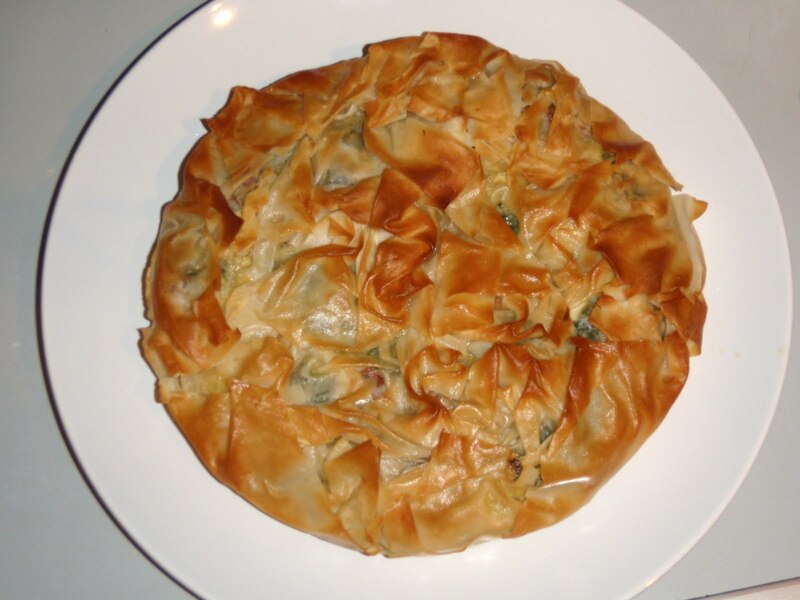 Unroll the filo pastry Use 3 (or 5 in my case) and put them on the base of the cake tin, one by one. In between each layer of pastry drizzle some of the oil from the sun dried tomatoes. Dollop the spinach, feta etc mixture on to the centre of the pastry base and then (if you’re using a deep cake tin like me) put the base into the cake ring. 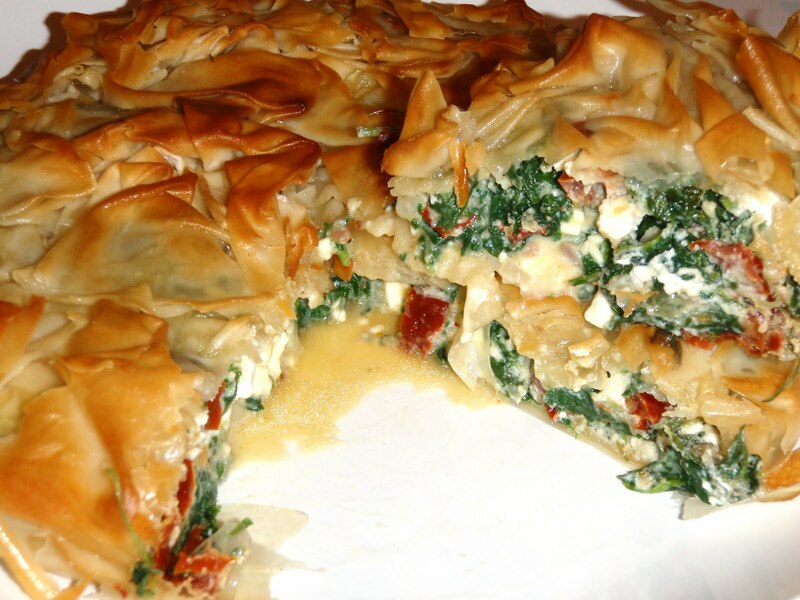 Add a couple more sheets of the filo pastry on the top to close the pie. If you want, drizzle a little more sun dried tomato oil. Put into the oven for 20 – 25 minutes until golden brown. I’m so impressed with how good it looks…. What veggie trial shall i do tomorrow! Love this, so easy to cook and so yummy! And little bit of charcoal adds to the flavour! Can’t take all the credit for this one, it was my version of something I saw on the good foo website, but it was so good, I’ve made it so many times!